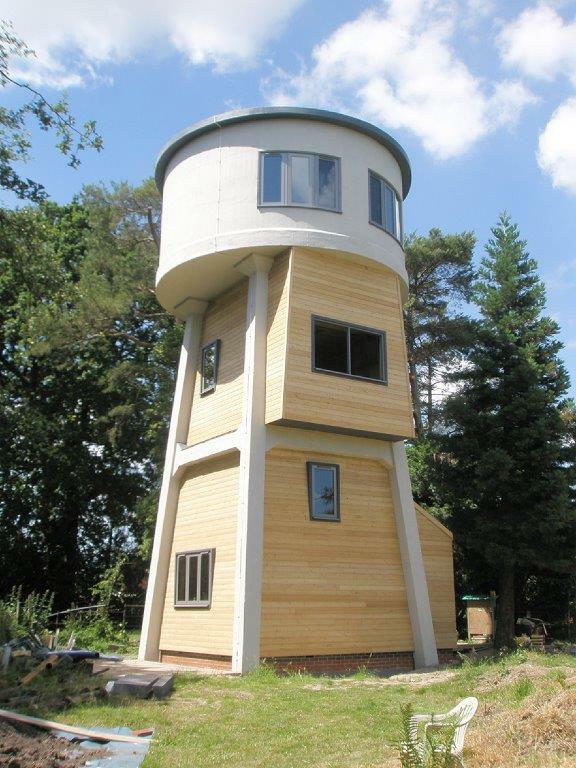 Specialist Paint for Burton Green Water Tower. There are two water towers in Burton Green. The large one in Cromwell Lane was built to supply Coventry and the smaller one, behind the school in Hob Lane, was built to supply Kenilworth. It is the one in Hob Lane property that is pictured. Kenilworth Urban District Council purchased a parcel of land from Long Meadow Farm in 1932 for the sum of £50 for construction of a Water Tower to supply water to the town of Kenilworth. A tender was accepted from Thomas Bates and Son Ltd of Coventry for the sum of £287 4s. 0d. It was completed in September 1933 for the increased sum of £325 1s. 0d. It leaked badly after construction and despite a bitumen coating and an internal concrete render continued to do so. It is understood that it was only used for a few years until the supply was taken over by the Coventry tower. It remained empty ever since. It was subsequently taken over by the South Warwickshire Water Board and in 1973 by the Severn Trent Water Authority. It was sold back to the owner of Long Meadow Farm in 1980 for the sum of £3250 and incorporated into the grounds of the house. The house together with water tower were purchased by the present owners in 1985. The tower had gradually deteriorated. The cladding around the input supply pipe fell away exposing the asbestos lagging and the concrete of the tower was spalling (pieces breaking off), Demolition, repair and conversion were all considered. It is part of the village's heritage and it was felt that it ought to be preserved. Change of use was granted and repair and conversion into holiday accommodation is now complete. Technical Paint Services were consulted for advice and their specialist knowledge of similar surfaces and environments to those at Burton Green Water Tower. Following professional cleaning and preparation, our E27 Acrylic Emulsion Range was applied with a Matt Finish, on both internal and external surfaces.